US crude oil inventories: The API yesterday reported that US crude oil inventories increased by 5.36MMbbls over the last week, compared to market expectations for a 2MMbbls draw, according to a Bloomberg survey. The API also reported builds of 3.61MMbbls and 4.32MMbbls in gasoline and distillate fuel oil, respectively. EIA weekly numbers will be released tomorrow, and if the release confirms a crude oil build over the week, it would be the 11th consecutive week of increases. OPEC meetings start: The rest of this week will be all about OPEC, with the Joint Ministerial Monitoring Committee meeting in Vienna today, this will be followed by the official OPEC meeting on Thursday, and then finally on Friday, the broader OPEC+ group will meet. We continue to believe that the market will need to see at least a 1MMbbls/d cut, while anything less would likely be viewed as bearish, as this would still leave the global market in surplus over 1H19. All eyes remain on Russia, with media reports suggesting that they are still resisting significant cuts. 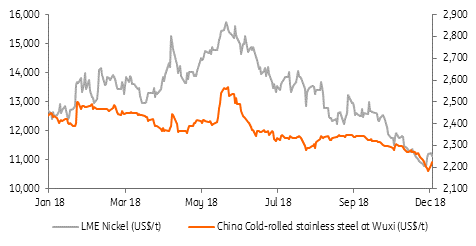 Nickel vs stainless steel: LME nickel prices have declined nearly 30% from their peak in June, while stainless steel prices in China have fallen by only around 7-8%. While demand concerns have certainly weighed on nickel and stainless steel prices more recently, growing nickel pig iron supply from both China and Indonesia has put further pressure on nickel prices. The current underperformance of nickel brings the nickel/stainless steel price ratio back to 5.0 from a high of 6.4 in 2Q18 – the five-year average for the ratio stands at 5.4. China copper premium: Chinese spot copper premiums fell 10% this week to their lowest levels in more than a year– spot premiums have nearly halved from a peak of US$120/t in early October to US$62.5/t currently. This does suggest that Chinese imports of refined copper have slowed from the very strong levels seen in previous months. Meanwhile, the LME copper cash/3M backwardation has weakened from US$44/t at the end of November to just US$3.50/t currently. Chinese soybean imports: Bloomberg reports that Chinese officials are preparing to restart US soybean imports following trade talks between China and the US at the G-20 summit. As we mentioned in our note from earlier this week, any sizeable increase in imports will be driven by state enterprises, whilst private buyers will likely resume the purchase of US soybeans once tariffs are removed. Cumulative US export sales to China so far this season (starting 1 September) stand at just 339kt, down from 14.98mt at the same stage last season. Indian sugar output: The latest data from the Indian Sugar Mills Association shows that cumulative Indian sugar production so far this season (starting 1 October through to the end of November) totals 3.97mt, up 1.5% year-on-year. While crop expectations for India have fallen as the harvest has got underway, the country is still expected to see a sizeable domestic surplus, which will continue to threaten the world market. Nickel: A messy divorce or amicable split for demand?